First a bit of history : J-10 is China's most modern fighter jet. Though Western Military analysts believe its capability to be on par with F-16 Block 40 at most, nothing can be said for sure. That being said because very less is known about the sub-systems and avionics this plane carries. 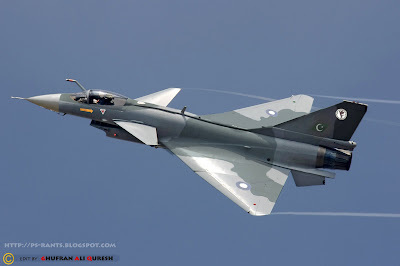 J-10 is also on offer to Pakistan and Pakistan Air Force accepted J-10 under designation FC-20 as its top notch fighter in quest of acquiring 4.5 generation multi role fighter. Pakistani cabinet in 2006 also agreed with the progression of the programme . The version that PAF will acquire will be an upgraded version of J-10, which will be in the league of Eurofighter and Rafale. Most likely end of 2009 will be the time these planes are actually handed over to PAF. And now back to the Picture : This particular J-10 is photoshoped in PAF colors, Though i would like to make it clear that the real FC-20 'may not be the same' in either camoflague pattern or color scheme. It is just my impression of PAF's FC-20. For those who might be interested, i used French Air Force Dassualt Mirage 2000 's Camoflague pattern to paint over this FC-20.